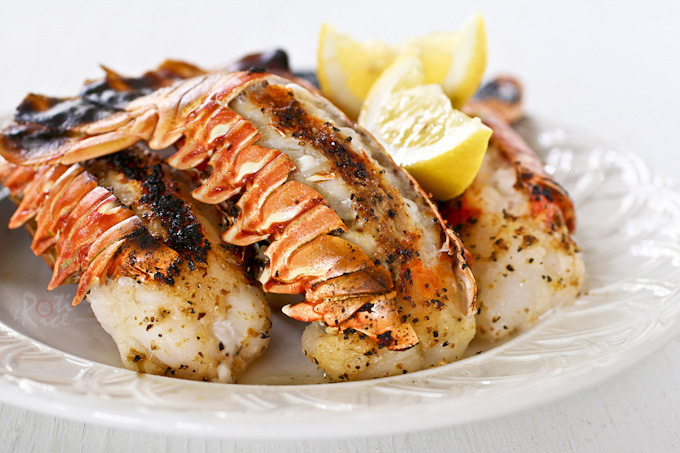 When there is a celebration, it is time to get fancy and serve up some Broiled Lobster Tails. This is not your everyday fare for sure as lobster tails can be pricey. 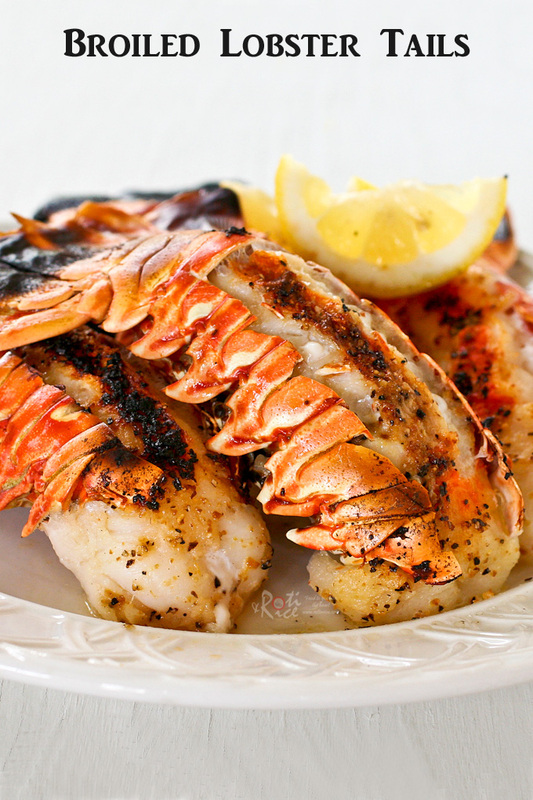 However, these succulent and delicious crustaceans are well worth splurging on for that special occasion. Broiling lobster tails is new to me. I was a little apprehensive at first as I was afraid I would totally ruin them all. What if I overcook them and they turn rubbery? Now, that would not be good. I search the internet on how best to go about it and was very happy to find this site with step-by-step instructions and broiling times. I would have preferred the meat to stand up a little more and spill slightly over the shell. The instructions did not say how this can be achieved. I would think it can be done by lifting up the flesh slightly and cutting a slit lengthwise so that it spreads outwards over the sides of the shell. I will have to try this out next time. The tail fins did burn under the broiler. Wrapping a piece of aluminum foil loosely over them would have prevented that from happening. Apart from the aesthetics and presentation, the recommended broiling times were pretty accurate. The flesh turned out to be quite juicy and succulent. Hold lobster with tail away from you. Cut on the right side of shell towards the tail. Repeat the process on the left side. Then make a cut across the back to free the top of the shell. Rinse the tail with cold water to remove any bits of shell and pat dry with paper towels. Combine melted butter, lemon juice, lemon pepper, and salt in a small bowl. Brush marinade over lobster flesh. Set oven to broil (500°F/260°C). 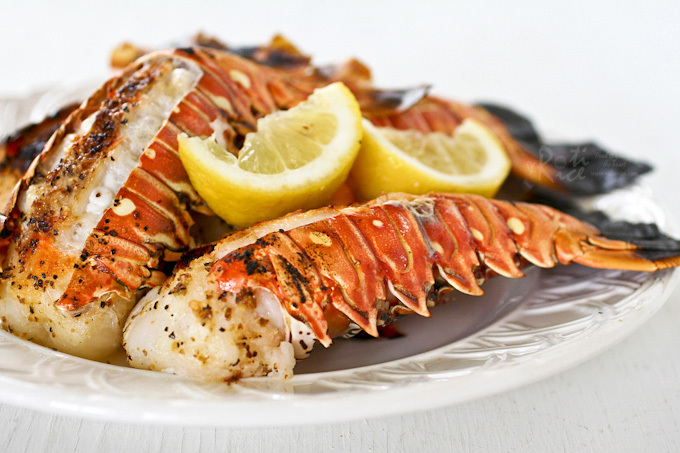 Place lobster tails on a broil pan and broil for 6 minutes. To prevent tail fins from burning, wrap a piece of aluminum foil loosely over them before broiling. I actually prepared a surf and turf for the family. 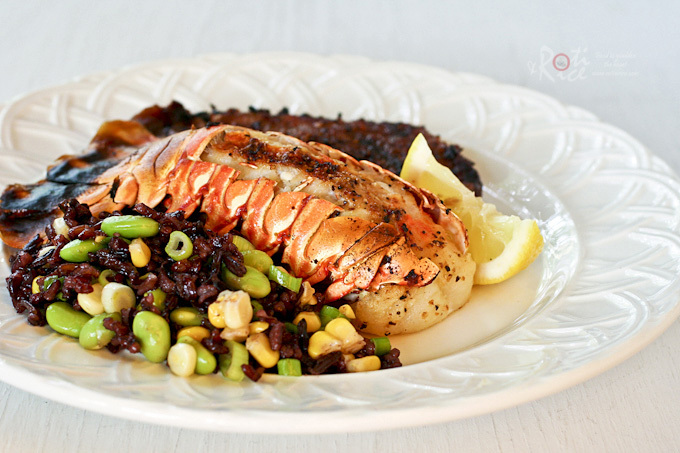 We had Broiled Lobster Tails and Grilled Ribeye Steaks with a side of Black Rice, Corn, and Edamame Salad. It was all so tasty and totally worth the splurge!